One-Term Tony? Australia’s Prime Minister Hoping for Reset. Australian Prime Minister Tony Abbott finds himself on the back foot after a dreadful week. Deloitte Access Economics has also this week predicted a much larger budget deficit than originally expected thanks, in part, to a fall in the cost of iron ore. It has been the government’s tough budget cuts that have continued to draw opprobrium. Though a hostile Senate of smaller parties and independents has made passing legislation more difficult, the government’s own mixed messages and admissions of untruths have proved lately to be the bigger problem. There has this week been ongoing confusion as to whether the A$7 ($6) co-payment to see a doctor will go through and an admission by the prime minister that he did indeed promise pre-election there would be no cuts to the ABC. The government achievement in securing free trade agreements with Asian giants has been forgotten in the quagmire of its contradictory claims regarding domestic policy. As we previously reported even conservative commentators like Andrew Bolt, once a loyal supporter, have turned on Abbott and his maladroit management. This week it is not just the right-wing heavy hitters such as Bolt or Australian columnist Janet Albrechtsen, but even Today show host Karl Stefanovic who have been grilling the prime minister, leaving him on the back foot and still blaming Labor even after more than a year in office. Stefanovic is not famed in Australia for his Paxman-like interviews. 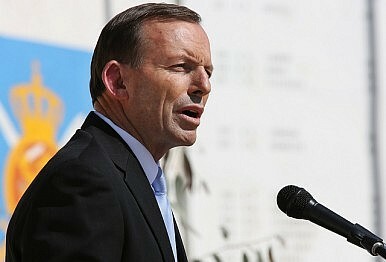 Abbott said at Monday’s press conference that the buck stopped with him but also blamed “atmospherics” for his government’s utterly dreadful previous week, before pointing the finger at the Opposition for, essentially, being oppositional, saying, “I think that the Labor Party are doing their best to sabotage the policy and sometimes the public see the soap opera. They don’t see the substance.” During his own time as an attack dog Opposition leader, Abbott took the view that it was not part of his job to see the government’s substance. And speaking of soap opera, today Palmer United Party Senator Glenn Lazarus issued a press release – albeit via Facebook – suggesting that Education Minister Christopher Pyne has been relentlessly texting him in a bid to get the needed support for education reforms, including upping fees for some courses and deregulating fees, despite the PUP’s steadfast opposition to the plan. Lazarus suggested that Pyne should stop “embarrassing himself.” Pyne’s efforts were ultimately to no avail: the Senate rejected the reforms yesterday. In international comparison, Australia still shows some of the best policy performances and governance.